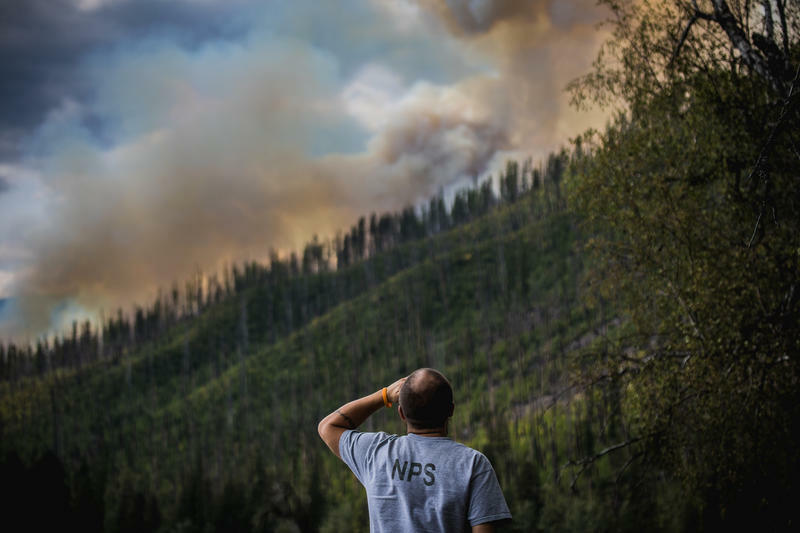 A Glacier Park employee surveying the Howe Ridge Fire the afternoon after it started on the night of August 11. Nearly all of the cabins at Kelly’s Camp at the end of North Lake McDonald road burned, including the Park-owned Big House and a handful of old resort cabins that were listed on the National Register of Historic Places. 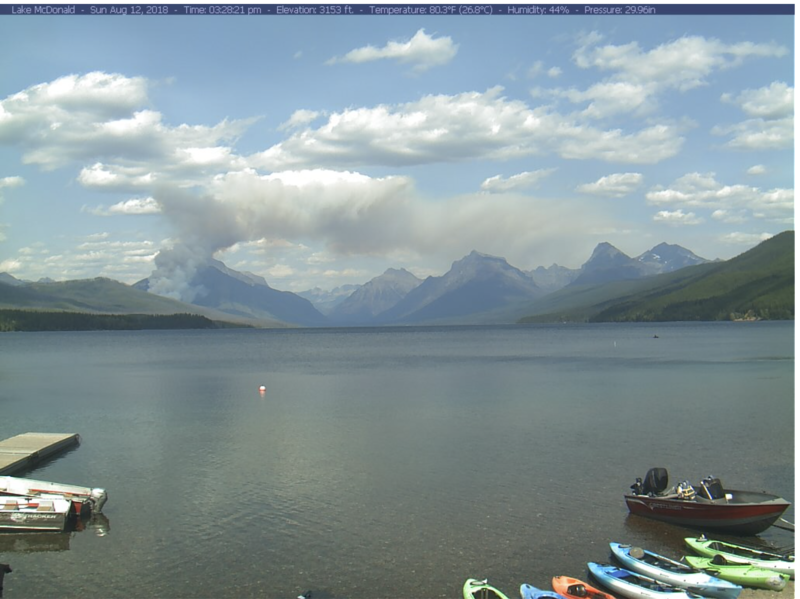 The boat launch at the Wheeler Camp is gone, as well as the boat launch at the Lake McDonald Ranger Station. 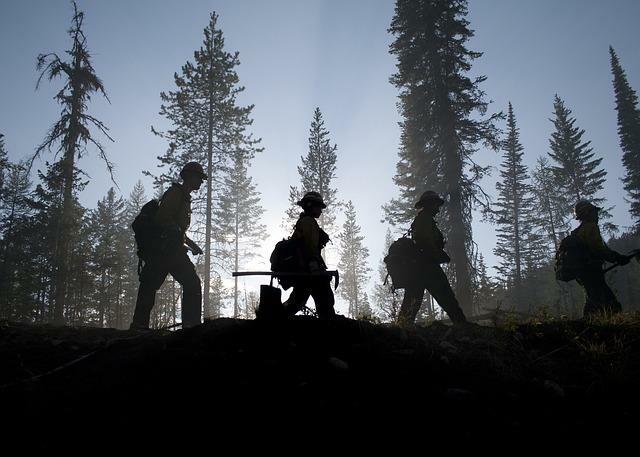 Firefighters were able to save both the Wheeler cabin and the Ranger Station after they caught fire. "To lose an entire area of the lake's development like this, in a single fell swoop, it's ... a big deal," says Jessie Ravage. Ravage is an architectural historian from New York who put together research that led to some of the cabins’ Historic Place designation. "It's this whole little microcosm, and it's really sad to think of one part of it is just gone." Ravage describes Lake McDonald as the birthplace of Glacier National Park. Native Americans had moved through the area long before the first white settlers, but by the late 1800s, five homesteaders staked claims around the lake. "It's very apparent from their homestead applications that they're bending the rules of the homestead act," she says. "The idea was productive farmland, not developing resorts. But if you're careful reading how they crafted their applications, it's very evident that all of them had the idea of having a resort on the lake. None of them was planning to be a farmer." Ravage says Frank Kelly, Kelly’s Camp’s namesake, had to fight for his claim after Glacier National Park was fully established in 1910. 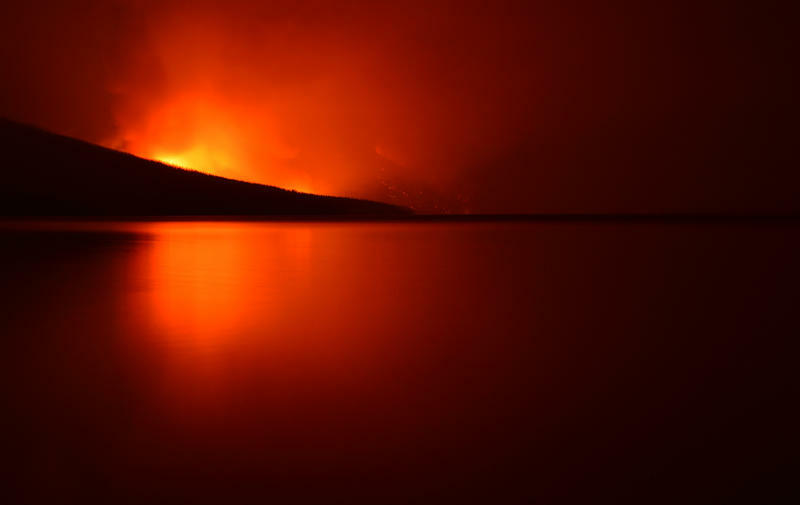 He held onto about 55-acres on the northwest shore of Lake McDonald. His camp started small, just a single tiny cabin where he and his wife Emmeline lived for the first winter. "And he pretty much built a cabin a year for about eight or nine years," Ravage says. Some of these small cabins retained the same lake-facing porches and gabled roofs from when Kelly built them in the early 1920s. Some even still had bark on their notched log walls. Ravage says many cabins from this era were built with local red cedar and chinked with clay scooped from the bottom of the lake. But she says the remarkable thing about Kelly’s Camp wasn’t so much the architecture, but the community that grew out of the summer enclave. "I think it might have been the most, the most like a summer colony where the same people came back every single year and they spent oftentimes the entire summer. It was not a place that drew very wealthy. It was people who were very middle of the road economically speaking, school teachers, ministers, seasonal park rangers," Ravage says. Some of those visitors later bought the cabins, passing their little slice of paradise down through generations, even as the Department of Interior periodically pressed families to sell their inholdings to the Park to consolidate land. Kelly’s Camp owners held out. "It's this place where everybody emotionally hangs their growing up hat, so to speak," she says. "This is where people, generations of specific families, grew up knowing each other." For Regina McGee, who has been summering at Kelly’s Camp Cabin 2 for more than a dozen years, the loss of the cabins is tragic. But she says their lore and the wisdom of their inhabitants will live on through her neighbors. "Pam is the most incredible hiker. She knows every rock of every ridge of every trail. Where are you going to go find that out? You're not going to find that in a book. You're going to bring her a bottle of wine, sit in her lawn chairs, look at the lake and she's going to tell you all the things there are to look for on those trails," McGee says. "You've got to sit down and invest your body and time and mind and let somebody give it to you, and it has to be gifted to you. You can’t just shake them and get it of them." 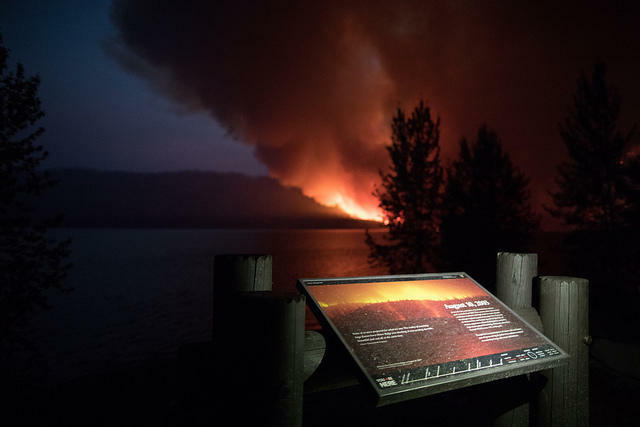 The National Park Service warns that the Howe Ridge Fire is still active and crews continue to protect the remaining structures along North Lake McDonald Road. Additional losses may be discovered after crews are safely able to access the area. 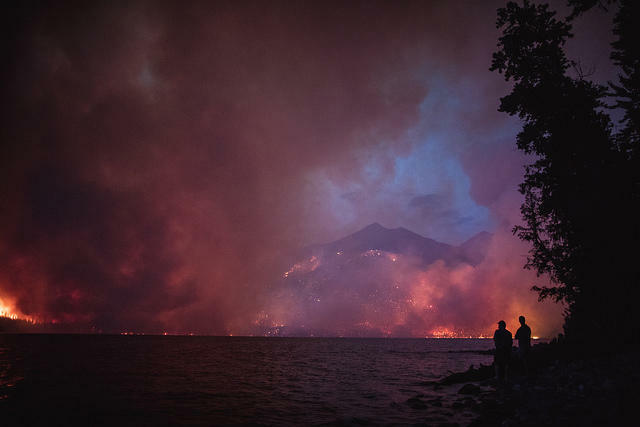 Officials in Glacier National Park now say that, “a number of structures were lost last night” in the Howe Ridge wildfire that was sparked by lighting Saturday.